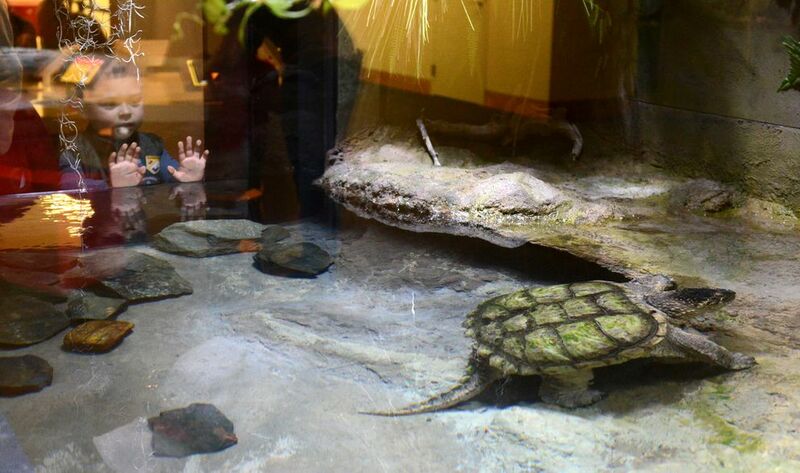 After a month out of the public eye, Chomper the snapping turtle was returned to his habitat in the Anchorage Museum's Imaginarium Discovery Center on Tuesday. 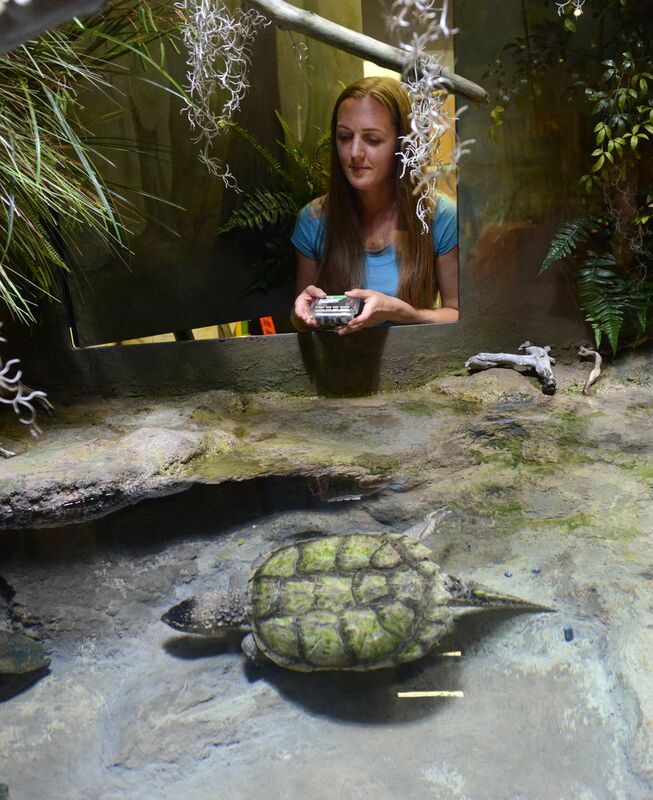 During his absence, artist Rebecca Carr Brubaker transformed his home into an expanded and freshly cleaned reptile paradise that would make any turtle even greener with envy. Chomper's upgraded dwelling is festooned with verdant fake plants and filled with locally sourced materials Brubaker gathered and treated. Brubaker also painted the habitat walls green to resemble algae. 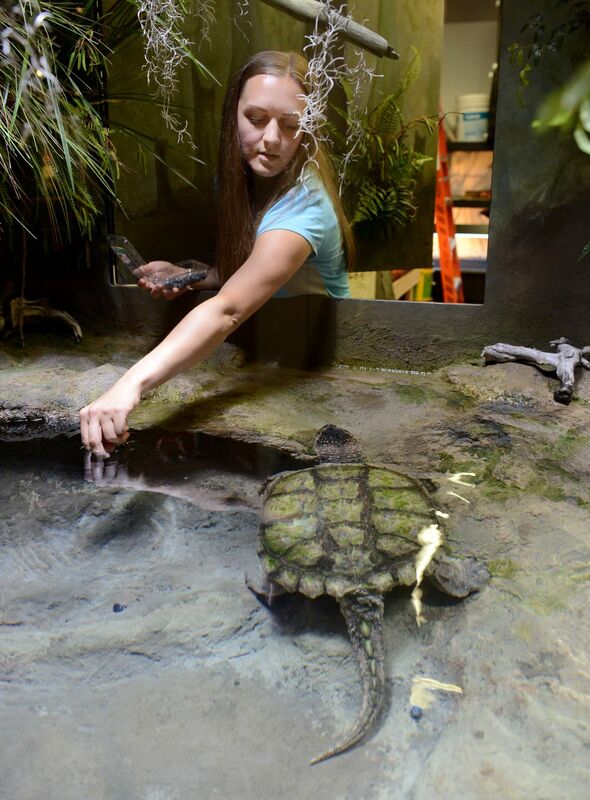 The bumpy, bobbing Chomper can scratch his shell on a log plucked from the Matanuska River, dig through fossilized rocks from Palmer, or simply float through the clear, calm water catching blueberries, salmon and other delicacies tossed in by animal care technician Nicole Abeln. "Chomper is so spoiled," Abeln said. "(The habitat) is a lot more beautiful than I even imagined." Chomper's fans are happy he's back where he belongs. Some were worried when they came to visit him during the past month and instead saw a sign saying he was currently off exhibit and should be back soon. "I thought he was sick and they were trying to keep our hopes up," said Isabella Weber, 12, at the museum Thursday. Her dad, Derek Weber, was relieved to see Chomper back in the swim of things. "He's my favorite part of the kids section," he said. "I'm glad they gave him more room." Tamara Ikenberg is a former reporter for Alaska Dispatch News.